This Cranberry Bread is speckled with chunks of ruby red cranberries, candied mixed peel, and almonds. It is a lovely tea bread with its almost bread-like texture that begs to be served in thick buttered slices with a hot cup of tea. Jane Grigson wrote a terrific book called 'Jane Grigson's Fruit Book'. She divided the book into chapters discussing various fruits along with recipes. It's a joy to read. 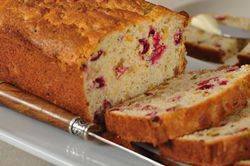 One recipe I particularly liked was for this Cranberry Bread. While I did adjust her recipe to fit a smaller pan, this quick bread really highlights the flavor of cranberries. You may be surprised to find that I have used fresh cranberries in this Cranberry Bread instead of dried. Many recipes today have moved away from using 'fresh' for the more readily available 'dried' cranberries. Although raw cranberries are quite bitter tasting with a hard outer skin, once they are baked their tartness softens as do their skins, which pairs very nicely with the chewy and sweet candied mixed peel. Candied mixed peel is preserved citrus fruits (oranges, lemons, and grapefruit) that have been dipped several times in a concentrated sugar syrup. It can be found in grocery stores during the holiday season, so stock up if you want to make this Cranberry Bread other times of the year. Now, I love this quick bread as it's so easy to make. Mix the dry ingredients together in one bowl and mix the wet ingredients together in another bowl. Then you just combine the two and you're done. We often think that quick breads should be eaten immediately after baking. Although this may be the case for most quick breads, it does not apply here. This Cranberry Bread is, as I mentioned above, very bread-like with a lower fat content than most other quick breads so it does need at least a day after baking to give it time to soften and to allow all the flavors to mingle. While perfect during the holiday season, don't limit it to just a fall and winter treat. Make sure to freeze an extra bag or two when fresh cranberries are in season so you can make this delicious quick bread year round. In a large bowl whisk together the flour, sugar, baking powder, salt, and orange zest (if using). Add the chopped cranberries, candied peel and chopped nuts and stir to combine. In a separate bowl whisk together the beaten egg, melted butter, vanilla extract and milk. Stir the wet ingredients into the dry ingredients just until everything is mixed together. Pour into the prepared pan, smoothing the top with the back of a spoon or an offset spatula. Bake for about 50-55 minutes or until a toothpick inserted into the center of the cake just comes out clean. Remove from oven and let cool on a wire rack. Wrap in plastic wrap and aluminum foil and store overnight before serving. This bread can be frozen.